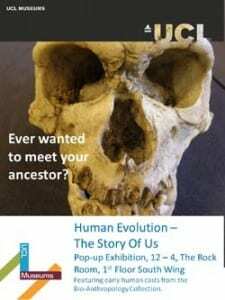 Ever wanted to meet your ancestor? On Friday 7th March the Rock Room (1st Floor Corridor, South Wing, UCL) will host a special pop-up exhibition featuring rarely seen objects from UCL’s Biological Anthropology Collection, and in particular their collection of early hominin fossil casts. UCL’s Biological Anthropology Collection is held by (unsurprisingly) the Biological Anthropology Section of the Anthropology Department. Biological anthropology focuses on the study of primate ecology and evolution, including the study of human evolution. In order to study and teach these subjects the department has built up a wonderful collection of over 2,000 bones, casts of bones and fossils, ancient tools and other types of objects (which I like to think of as ‘misc’). These are stored in the department and heavily used in teaching, helping students to bring the subject (back) to life.